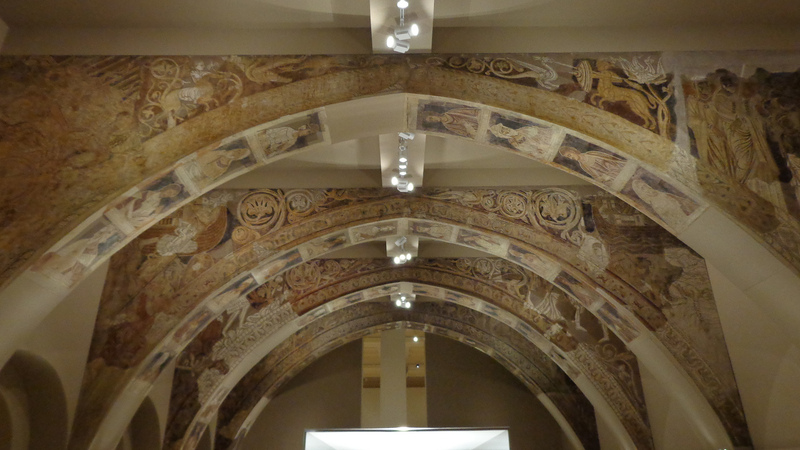 The autonomous government of Aragon has formally requested the return of 13th century frescoes removed from the monastery of Santa María de Sigena during the Spanish Civil War and now installed in the Museo Nacional de Arte de Cataluña in Barcelona. The also-autonomous government of Catalonia has not been receptive. Ferran Mascarell, Catalan Minister for Culture, said on Thursday that the government will do everything in its power to keep the frescoes where they are on the ground that if Catalans hadn’t conserved the frescoes, they would not exist today. This is not a solid legal argument, as the Catalan government has good reason to know since it too has campaigned vigorously for the return of historically significant items from places where they were conserved. Most recently the Salamanca Papers, a vast number of documents, books, magazines, newspapers and more that Franco pillaged from universities, trade unions, political parties, private homes, publishers etc. in 1939, have begun to be repatriated after a decades-long struggle in the legislature and courts. Aragon has wanted the frescoes back for a long time, but the government wasn’t the official owner of the monastery and thus had no legal rights to claim the frescoes. The Order of the Hospitallers of St. John of Jerusalem has owned the historic building for eight centuries, although their nuns left in 1835 after anti-clerical legislation promulgated by Queen Isabel II’s prime minister Juan Álvarez Mendizábal privatized monastic properties thus stripping the convent of its revenue. Some nuns filtered back over the years and since 1985, the Order of St. John has allowed the sisters of Bethlehem and the Assumption of the Virgin and of Saint Bruno to carry on the tradition of monastic prayer at Santa María de Sigena. The Order of St. John couldn’t just hand over the monastery without getting permission from the Vatican. Finally earlier this year the Vatican granted the Order permission to cede the rights to Aragon, so now the Aragonese government is the proud owner of a 13th century monastery in the Spanish Pyrenees. That gives them the right to take Catalonia to court should they refuse to hand over the frescoes. Since Catalonia only possesses the works because they were sent there in 1936 for conservation, not because their ownership was officially transferred, any legal battle is likely to favor the repatriation. The frescoes were removed by order of government during the Civil War, and are therefore spoils of war just like the Salamanca Papers. The monastery was declared a national monument in 1923, which also puts the frescoes’ removal in contravention of pre-existing Spanish law. 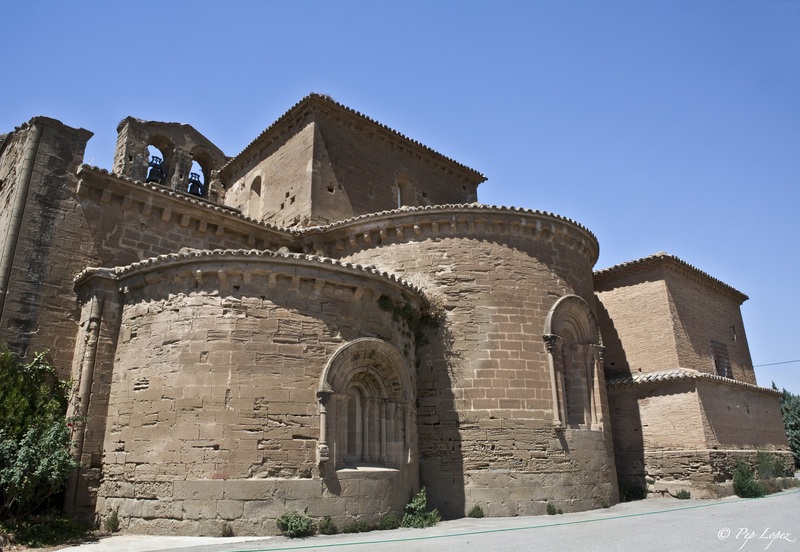 Santa María de Sigena was built between 1183 and 1208 by order of Queen Sancha of Castile. Intended to house nuns from the cream of Spanish aristocracy, the monastery was built in rich Romanesque style and was elaborately decorated. No expense was spared. 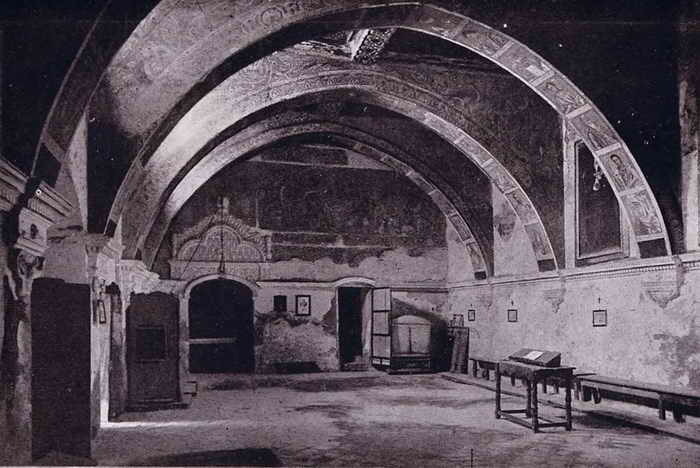 The frescoes on the arches and vaults of the chapter house — plant and animal motifs accompanying scenes from the Old and New Testament and 70-80 portraits of the ancestors of Jesus starting with Abraham — were painted by the best English artists using precious materials like gold and lapis lazuli. This approach was employed nowhere else in Spain at this time. Historians believe the frescoes were painted by English artists who also worked on the Guardian Angels Chapel in Winchester Cathedral, the chapel of St. Anselm in Canterbury Cathedral and on mosaics in Norman-ruled Sicily in the mid-12th century. Queen Sancha was buried in the convent church after her death, as were her daughters Dolça and Leonor and her son King Pedro II of Aragon. Its royal burials and architectural and artistic beauties couldn’t save it from a hideous fate during the Civil War. In fact, they probably condemned it. Santa María de Sigena was burned in 1936 by Republicans forces who were no fans of the monarchy or the Church. The royal tombs were desecrated Vultures followed to pick at the carcass and looters helped themselves to everything they could take, including the art on the walls, the wooden paneling, the devotional objects, the furniture. 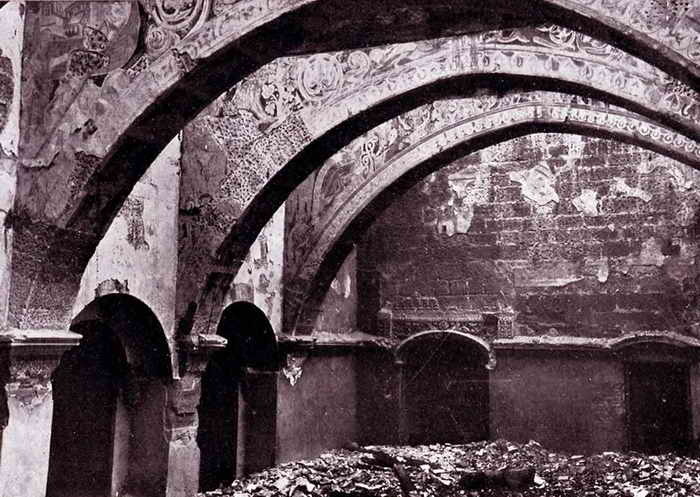 The chapter house frescoes were horribly damaged by the fire, some destroyed completely, some missing large pieces, all drained of their once-brilliant color. To save what was left, in 1960 the paintings were removed and sent to the National Museum in Barcelona. There they were conserved, ultimately finding permanent placement affixed to arches and vaults designed to replicate the convent chapter house’s structure. 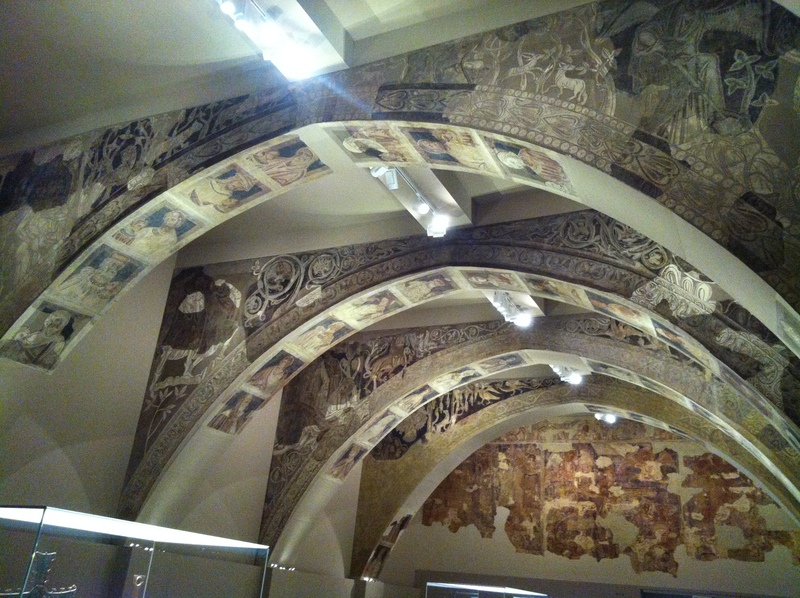 The museum has an impressive collection of Romanesque frescoes removed from the walls of other churches and monasteries. 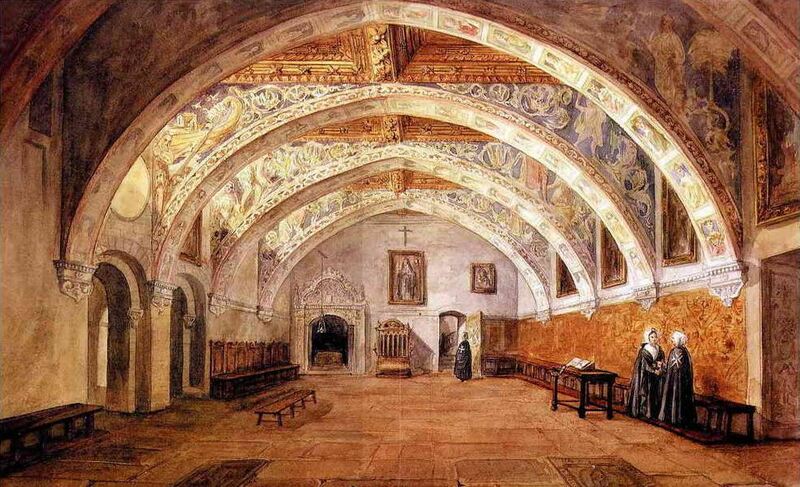 You can take a tour of the museum’s Romanesque rooms on Google Art Project. (That link isn’t taking me directly to the proper location, for some reason. If you find yourself on the first floor, click the dropdown and choose the ground floor, then click on the light grey rectangle above and just to the right of the large oval room in the middle.) Compare what’s left with the black and white pictures taken right before the fire by photographer Ricardo del Arco. Meanwhile, back in Aragon, the monastery got some long overdue attention. In 1974 the cloister was rebuilt. Between 1988 and 2009, the government of Aragon undertook an extensive program of restoration costing 3,350,447.71 euros ($4,425,271.34). 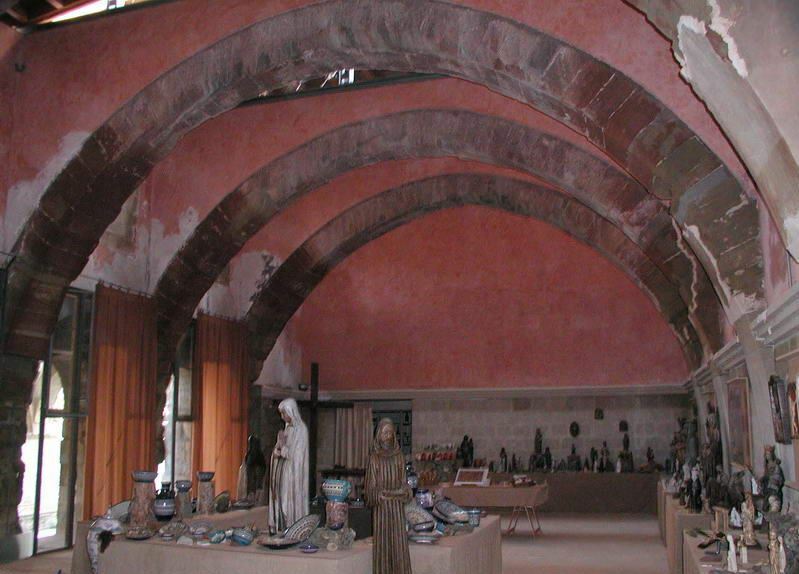 Now that the structure is stable, Aragon wants to return the frescoes to their original location in the chapter house.